You have to periodically clean CRT (Cathode Ray Tube) or LCD (Liquid Crystal Display) screens to get rid of fingerprints and dust. The Mac glossy screens are both the most delicate and the ones that get dirtiest fastest. Here is a safe way to clean them. 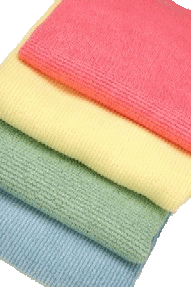 Use a microfibre cloth or chamois, not a scratchy paper towel. Get the bulk of the dust off with a clean microfibre cloth. Mist a microfibre cloth with a sprayer of plain water. Don’t spray the screen directly. Wipe away the dirt, dust and fingerprints with small circular motions. Finish by wiping with a dry microfibre cloth. If that does not work, use a screen cleaner product, one designed for screens or eyeglasses, ShaggyMac Opti-Mist Prime. Ordinary glass cleaners may be too harsh for some LCD screens. They should be fine for the older glass CRT screens.